Last weekend I was in London so I thought I would show you what was in my handbag for the trip! I always tend to pack a bit more into my handbag on a flight hence why I love a good roomy tote. This one from Prada is perfect for 'chucking stuff in', it's a bit like the Mary Poppins of handbags! Tote bags are my favourite and I prefer to carry them in the crook of my arm rather than over the shoulder-reminds me of my nan in the crook of the arm. I don't use this Prada one every day and just keep it for special occasions. I bought this Prada on the way back from Vegas the year before last from Terminal 5 in Heathrow. It's a classic style that Prada bring out every season but in different colours. I wanted the black so it would go with everything. It's a classic tote with no compartments and one large zip pocket on the back 'wall' of the bag. I love it because I can literally throw loads in it and have it all easily to hand. It has gold hardware and an expandable fastening on each side. I recently did a post on my long haul flight essentials here so you can see what I carry in my in flight 'clear' make up bag. I have had the Louis Vuitton make up bag for about 12 years-I think it was the first 'designer' item I ever bought and I love it. I'll do a 'what's in my make up bag' post at another time but I carry this make up bag every single day with me! Finally I love these little hangbag friendly size Jo Malone perfumes-my current go to is Red Roses. My best friend Danielle bought me this pink Prada key holder for Xmas a couple of years ago and this is another item I use daily as it has my office keys on it as well as my suitcase key and house key. I bought this Aspinals monogrammed travel wallet when I started my new job almost 2 years ago and its very worn now as I fly a lot but it's well loved! When I travel I take my Ipad mini and Kindle but I don't carry these every day-the Ipad mini is brilliant for travelling. My Aspinals diary was a Xmas present from my lovely friend Hannah and I absolutely love it, it's so handy to carry round every day. The colour is amazing too-as you can see I love a bit of pink!! This Mulberry pouch is so handy-I store my ipod and headphones in it. I use my Iphone day to day when I am in Dubai and my Blackberry when I am travelling-both have the same number but I have a fantastic roaming contract on my Blackberry which isn't available on the iPhone so it saves me a LOT of money when I am abroad! More pink! I love this little coin purse even though its probably 10 years old now. 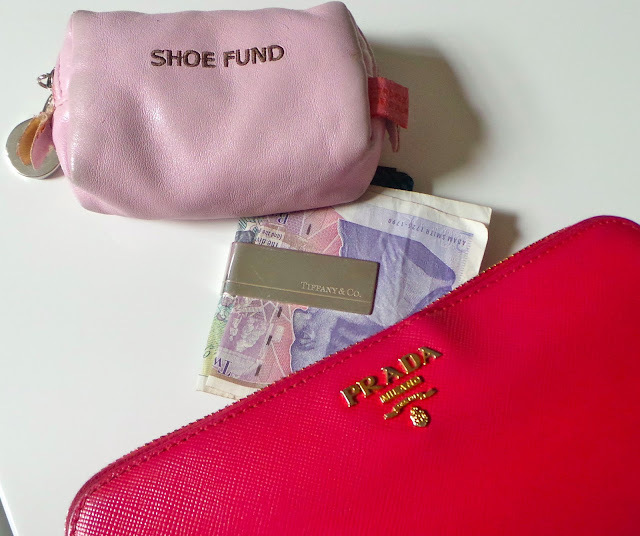 The Tiffany money clip and Prada purse were both gifts from Danielle-that girl has amazing taste! I have a little Tory Burch cross body bag which is fab for hands free shopping but doesn't fit a purse in so the money clip is really useful. As you can see I am obsessed with having my initials on stuff!! And Aspinals is great for that. This card wallet holds all my membership cards and the cards I use most infrequently. The Canon camera was a birthday gift off my other half and I bought the Gucci glasses on my last trip to London at the beginning of May. The compact tangle teaser is a genius invention-had to get the pink of course!! This scarf is my absolute favourite! It was the first 'Stephen Sprouse' edition LV scarf and it's really warm. I never use it when I am in Dubai and keep it stored in it's protective case, but it comes on every trip abroad with me. It's really versatile and a great edition to a plain outfit. This Swarovski pen was a gift from my friend Hannah when I got my new job and I adore the way it sparkles in the light. I've since expanded my collection and bought two of the other colours and had another one gifted to me by my friend Anna. Finally the This Works In Transit No Traces was a final, throw it in at last minute addition on this trip as a replacement to micellair water to remove my make up on the flight and they are great! They're liquid infused individual pads you just swipe over your skin. They contain rosewater and water mint and feel lovely and cooling on the skin and I couldn't believe how soft my skin felt after using them. The pads are just 'wet' enough for you to feel like you're really cleaning your skin but not too wet that they're messy to use. Really handy and definitely something I will use again when travelling or when I am feeling lazy! !